This is a list of more Simpsons jokes that have come true in the real world. Is this life imitating art? Or is some sort of higher power (be it spiritual or extraterrestrial) that's working through the pop culture juggernaut to give us some kind of grave warning about or future? Maybe. Or maybe those Harvard writers are just really smart and funny and have pretty good foresight as to how the world works. Below are ten jokes that have happened in the lives of Homer, Bart, Marge, Maggie, and Lisa that have seemed to cross over into today's world. Special guest appearances by Adam Sandler, Adam West, and a deformed three-eyed fish. In the classic episode “A Fish Called Selma,” washed up actor Troy McLure (the late-great Phil Hartman) finds a new spark in his career when he’s seen on a date with Marge’s sister Selma – helping to squash the rumors of his fish fetish. Troy finds new luck in the entertainment business and his first gig is the lead in “Stop The Planet of the Apes, I want to Get Off!” – a Broadway musical adaptation of Planet of the Apes (the movie, not the planet). Let’s face it, Theater is dead – well, at least mainstream theater, but that doesn’t mean Broadway does not know how to make a shameless brand cash-in to save time like it’s brother Hollywood. Nowadays there have been plenty of movies that have been turned into pointless stage musicals. Here’s a few: Sister Act, Legally Blonde, Shrek, The Wedding Singer, Catch Me If You Can, Ghost, High Fidelity. 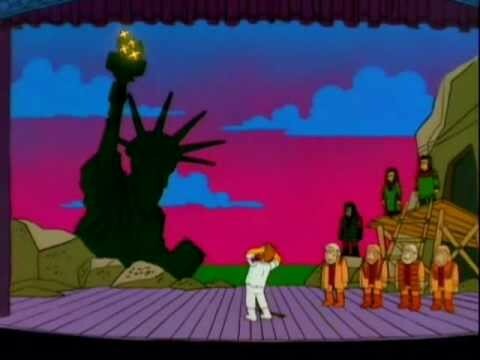 I would actually pay good money to see the Planet of the Apes musical as seen on The Simpsons. To this day I’ll catch myself singing “Dr. Zaus” and “You’ve Finally Made a Monkey Out Of Me.” It’s not that far fetched of an idea given the list above. It could even be a fun underground musical like Evil Dead, Reanimator, and Point Break. The episode “Radioactive Man” found Springfield’s most beloved comic character getting a big budget Hollywood film. The lead role went to Arnold Schwarzenegger stand in Rainier Wolfcastle, and his cast was made public by use the Internet. The scene shows a person sitting under the table of a producer meeting and him sending out the information to hundreds of computer nerds (included guitar wizard,Prince). It’s kind of amazing how early to mid-'90s Simpsons episodes had a pretty good foresight of what the internet was going to be used for – and keep in mind this was all through the dial up age. Today we live in a world where a man tirelessly tracks down ever lead he knows in order to find out who’s going to be playing Ant Man. Seriously, there are people losing sleep and have hard, well-thought out opinions as to who should be playing Ant Man. But I digress, The Simpsons also gave the internet one its most popular battle cries, “Worst. Episode. Ever.” in the episode “The Itchy & Scratchy & Poochie Show.” The whole scene sums up the relationship between viewers vs. creators in the digital age long before the Internet is what it is now. In it Comic Book Guy feels cheated by the addition of the terrible character Poochie and feels that the show’s creators “owe him.” To which Bart replies, “ What? They’ve given you thousands of hours of entertainment for free. What could they possibly owe you? I mean, if anything, you owe them.” That basically sums up the relationship between the fans vs. the creative team of Lost. Blinky the three-eyed fish made his first appearance on The Simpsons back in 1990 in the season two episode "Two Cars in Every Garage and Three Eyes on Every Fish." In it Bart catches a three-eyed fish in a river that runs down stream from the Nuclear Power Plant. This prompts Mr. Burns to run for governor in order to save the plant. He loses the election by spitting out eating a cooked three-eyed fish. Ever since then Blinky has become the unspoken mascot for the show, appearing in several episodes in cameos, and appearing on a good chunck of Simpsons merchandise him – he’s even appeared on Futurama. Blinky did pretty well for himself for a satirical jab at the horrors of shoddy nuclear safety. In real life a three-eyed fish isn’t as cute as Blinky. Back in 2011 it was reported that fishermen in Córdoba, Argentina caught themselves a three-eyed wolf fish. The fish was actually caught in a reservoir that was fed by the local nuclear power planet. The fish was taken in for testing to see if it was conclusively caused by Nuclear power. May God have mercy on us all, and if the end is neigh may it be swift. The season nineteen episodes “That 90s Shows” has two missions on its mind. The first: to fix the timeline of the Simpsons. Bart’s still ten years old, so to fix this Marge and Homer now have met and had Bart in the 90s -- although by today’s standards Bart is now a post-9/11 child (chew on that). The second: to make jokes about the nineties. Though Simpsons purists (like myself) tend not to like this episode (Homer as a lead in a Nirvana type grunge band, ugh), but upon rewatching has it’s laughs and there’s a great joy in its nostalgia for the nineties. The episode is cholk full of nineties jokes/references that include Sonic the Hedgehog, Melrose Place, Weird Al, Kurt Cobain, recumbent bikes, Friends, Seinfeld, etc. “That 90s Show” came out in January 27, 2008, when eighties nostalgia was all the craze. Now it’s 2013 and we couldn’t be more crazy about the nineties. Your friends are throwing nineties parties, go to a karaoke bar and all you’ll hear is music from the nineties, and really turn to any corner of the internet and you’ll find some kind of reverence, parody, or deconstruction of the nineties. 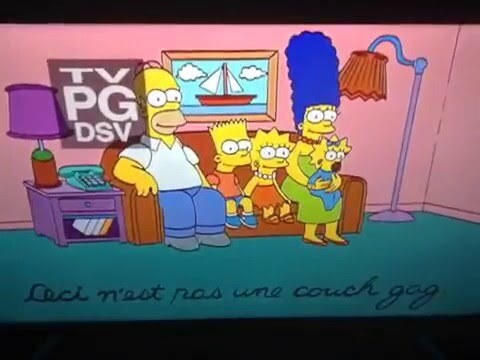 The Simpsons did it before it was cool.